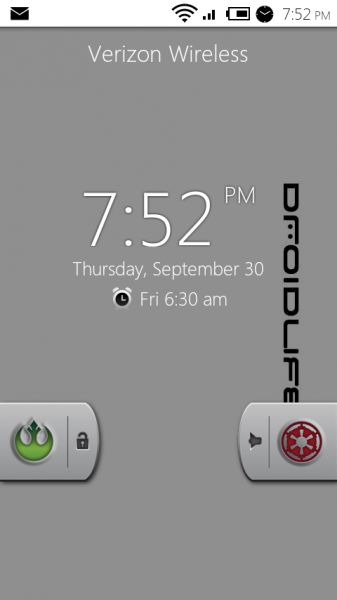 If you’re the owner of the Droid X or jumped ship on the Droid 2 before the special Star Wars R2D2 edition launched yesterday at select Verizon Wireless communications stores yesterday, then you’ll be happy to know that the custom lock screen available on the R2D2 Droid 2 edition has been ported to the Droid X and Droid 2. The hack, which will require a rooted handset, is detailed on Droid-Life with instructions and the necessary files. Although the U.S. government has recently “legalized” rooting with an updated version of the DMCA rules, the hack detailed by Droid-Life does contain proprietary files and information that’s specific to Motorola, Verizon Wireless, the Droid 2 R2D2 Special Edition handset, and affiliated companies, and may not be legal. Before proceeding with the hack, you should understand the laws and ethical implications in your jurisdiction.